THE pairing of Pete Bowles and Paul Howard took the honours at Remenham Angling Society’s Rodney Pook memorial pairs match. Fished at Bowsaw and Billhook Lakes near Odiham, 32 anglers from around the South East lined the banks for the match now in its sixth year. Winning pair on the day were Bowles and Howard with three points. Bowles won his section on Bowsaw peg 11 with 73lb 4oz of carp mainly caught short on the pole with meat and Howard finished second in his on Billhook peg nine with 43lb 10oz again catching carp short and down the edge. In second place in the pairs were Ian Dixon and Tony Frost with five points and third were Malcolm Pearce and Russell Grimes with six points on weight from Simon Willsmore and Trevor Pearce also on six points. Section winners in A, B, C and D respectively were Bowles with 73lb 4oz, Grimes with 54lb 8oz, Willsmore with 52lb 8oz and Mark Bowerman with 91lb 8oz. Bowerman, who fished meat on the long pole and at five metres on peg 16 on Billhook, weighed in an all carp net of 91lb 8oz to finish as top individual. 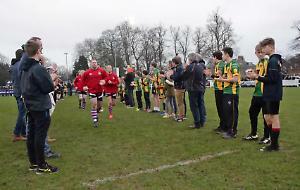 The match raised £275 for the Royal Berkshire Hospital intensive care unit.